Halloween might not be as big as Black Friday and the holiday season but it is still a major opportunity for e-commerce retailers. In 2017, US Halloween retail spending reached a whopping $9.1 billion, up from $8.4 billion the previous year (eMarketer). The predictions for 2018 are promising. According to Shopify, consumers are expected to spend $3.4 billion and $2.7 billion alone on costumes and decorations respectively. This presents a sizeable market for e-commerce retailers. If you’re looking to up your Halloween marketing game, you’re in luck. Read on for useful tips to help you. We looked at e-commerce promotional emails from Halloween 2017 and found common trends. Many brands had a 31% off sale in the spirit of Halloween falling on the 31st day of October. They stuck to giving fixed percentage discounts. We did not see any brands offering free gifts or shipping exclusively on Halloween. Another common item found in the emails was fun Halloween-exclusive coupon codes like “MYSTERY40”, “WITCH” and “TREAT20”. The emails also stuck to an orange, black and white color theme in keeping with the Halloween mood. The majority of brands sent Halloween emails only on October 31, with a few brands sending emails the week before Halloween. 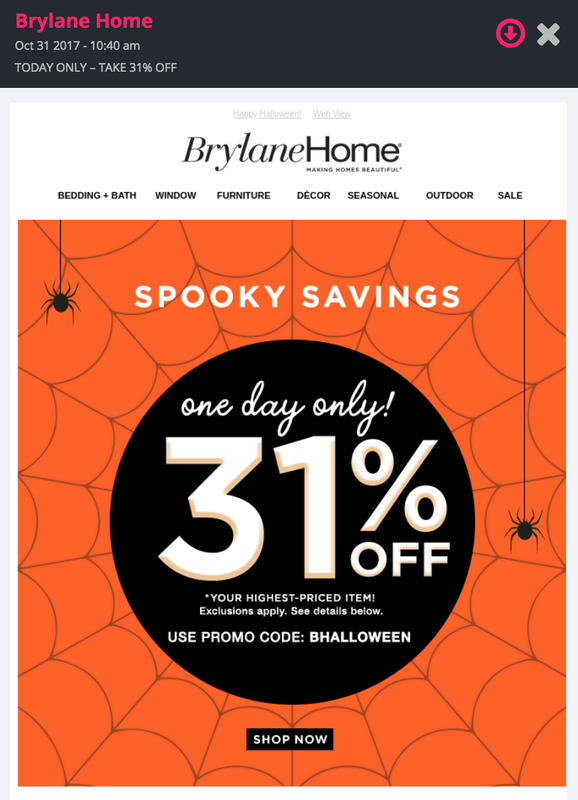 We recommend sending the emails on the day itself as Halloween tends not to be a long promotional event for most retailers, but rather celebrated on the actual day. However, if your brand is selling halloween-related items such as costumes and decorations then sending emails beforehand is necessary as these purchases are made before the actual day. The emails included halloween-themed words such as “Trick or treat”, “Spooky”, “BOO”, “Scary” and “Thriller”. These words appeared more often in the email content rather than in the subject lines. The subject lines were varied, with some purely focusing on offers such as “Ends midnight - take 31% off”. Others had a slightly more Halloween ring to them “No tricks, all treats. Up to 70% off…”. Interestingly, only 1 out of 10 brands mentioned the word “Halloween” in the subject line. We did not see any exclusive Halloween products featured in these emails from retailers. Brands were promoting their usual products such as women’s tops, accessories and dresses, but with a special sale on Halloween. Interesting, right? If you want to see what brands are up to during other holiday seasons, view emails and homepages from 600+ brands on Plannista’s Time Machine. Email marketing is just one way to reach customers. So what else can you do for Halloween? Halloween is a great time for e-commerce retailers to loosen up and have some fun. Create engaging, eye-catchy visual content to grab attention and social media shares. This will draw viewers, followers and eventually brand awareness. Perfect for lead generation. Spice it up by adding Halloween elements like jack-o-lanterns, spiders, webs and skulls to your usual product graphics and branding. Brands can also host a social media contest for customers. Ask people to submit photos of their best costumes, carved pumpkins, dressed-up pets and halloween decorations to win prizes like exclusive discounts or products. Have fun with hashtags. Create a customized halloween hashtag so everyone can keep track of entries, be inspired and spread the word about the contest. Check out this site for good Halloween contest ideas. So now that you’ve mastered the art of email marketing and have ideas about what to do on social media, don’t make the mistake of neglecting your website. As with Halloween content across all channels, include Halloween graphics and themes on your website. After all, your emails and social media content link to your website and you want them to be consistent. This is where your customers will make the final purchase decision. You want to keep things user-friendly but also exciting. All of this involves a lot of planning and collaboration between the creative and e-merchandising teams. Brands should start planning well in advance to ensure they have enough time to create the content and execute the Halloween campaigns. Decide what you want to feature on the homepage, emails and social media platforms. Look at what brands did last year for inspiration. Then map out a time-frame for each campaign. Plannista’s calendar is a great tool to plan your marketing content. Used with our time machine, a collection of emails and homepages form 600+ brands, you’re guaranteed to get creative inspiration and an amazing Halloween campaign! So go forth, brainstorm about what contests, graphics and promotional offers your brand is going to do and create a killer Halloween campaign.